Featuring 50mm driver units that reproduce crystal clear sounds in high, low, and mid-range tones is at the core of what is creating an incredible Diablo® III audio experience. Whether it’s the ominously toned soundtrack, the approaching hiss of a Witch Doctor’s firebomb or the bloody rage of a Barbarian whirlwind, users will clearly hear the gut wrenching hurls and exploding innards of your enemies. Alert the world around you that you’re in the game. 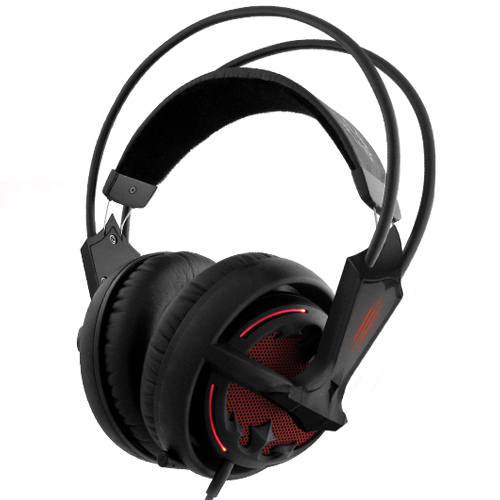 – The matte black headset features “demon” red, LED illumination on the right and left side Diablo® III logo slashes and around each earcup. Choose your pulsating glow or if lights don’t interest you, easily turn it OFF via the SteelSeries Diablo® III Headset software. Clear sound reproduction – from the atmospheric music to bones shattering. Diablo® III themed driver for Mac OS X and Windows. 2 illuminated zones including ear cups and Diablo® III slashes. “Invisible”, retractable, uni-directional microphone in left ear-cup. Lightweight headband suspension for comfort during long gaming sessions. Best place to buy the SteelSeries Diablo III Headset?